They are unhappy that the court released their colleague's attacker. 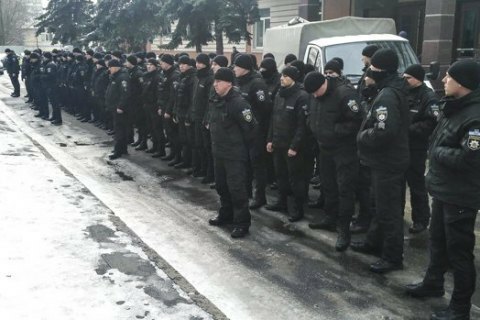 Kyiv police officers held a silent protest outside the city’s Shevchenkivskyy district court on 20 February. They were expressing solidarity with the wounded police officer whose attacker was released from a remand centre by the court, the Interior Ministry’s press secretary, Artem Shevchenko, told LB.ua. He said that although police cannot go on strike by law, they came to express their silent disapproval of the judge who released the person, who wounded their colleague on 15 February, on the surety of MPs. Interior Minister Arsen Avakov demanded that the Supreme Council of Justice take an immediate action with regard to the judge and that the prosecutor’s office and the court of appeal immediately issue a fair decision in the police officer’s case. He also threatened to remove security from courts. The Supreme Council of Justice described the minister’s reaction as pressure on the judiciary.